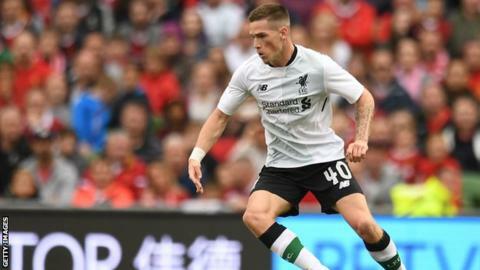 Rangers have completed the season-long loan signing of Liverpool winger Ryan Kent. The England youth cap has made just one top-flight appearance for the Anfield club. "This move had to be the perfect one, and when Rangers came around, I think it is," Kent told Rangers TV. Kent links up with former Liverpool captain Steven Gerrard and says the Rangers manager was a big pull in him moving to Ibrox. He said: "I think when the opportunity came around to join a club of this magnitude, it was a bit of a no-brainer. "They have got a person in charge now in Steven Gerrard who has played at the highest level and achieved many great things. "I would say I am an exciting player, and I never hold back. I don't fear getting on the ball, even if I've lost the ball. I am hopefully going to bring a lot of excitement to the fans here at Rangers." Kent has spent the majority of his time as a Liverpool player on loan; with spells at Coventry City and Barnsley, while he made a combined 17 top team appearances last season at Freiburg and Bristol City. "I would say every loan move I have had has benefited me in some sort of way, whether it has been a disappointing year in terms of how much game-time I have had, or a positive experience - either way, I have taken positives away from every loan spell I have had," he said. "I made my debut against Bayern Munich at the Allianz Arena [for Freiburg] and was involved in a promotion chase with Bristol City, so I did take a lot away from last season."